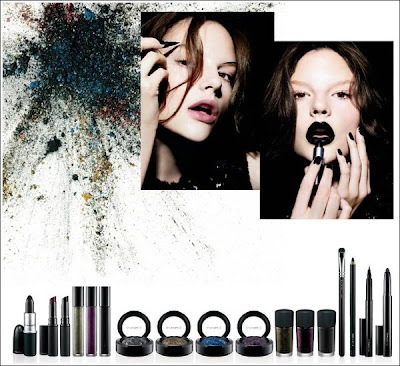 finally, MAC Style Black is coming here in the Philippines and will be launched this coming Saturday, October 24.
i love BLACK...actually, i love anything dark :) i haven't decided yet what else to get from this collection, but i have my eyes on that black lippie. don't worry, i won't be wearing that at work. LOL! how about you? is there anything you'd like to get your hands on from this collection? i honestly want to get some of the MES and that volcanic ash exfoliator, but nahhh...maybe not. or maybe yes...hahaha! I've done FOTDs with Black Bat CCB and Glimmerglass in Bling Black. I also got the Volcanic Ash Exfoliator, and I love it!! We're not getting this too soon, either. Next time at MAC PRO I'll ask when it comes out in Argentina, since I don't want to miss out on the Volcanic Ash Exfoliator! Then maybe I'll get a Greasepaint Stick, depending on whether I like it or not in real life.